UNITED NATIONS -- A proposed new U.N. sanctions resolution would significantly increase economic pressure on North Korea to return to negotiations on its nuclear and missile programs by banning mineral and seafood exports worth over $1 billion -- a third of its total exports last year, a Security Council diplomat said Friday. The draft resolution obtained by CBS News would also prohibit countries from giving any new permits to North Korean overseas guest workers, ban new joint ventures with North Korean companies and slash new foreign investment in joint ventures that are already operating, CBS News' Pamela Falk reports. Egypt, which holds the Security Council presidency, said a vote on the draft resolution has been scheduled for 3 p.m. EDT on Saturday. For over a decade, the U.N. and the U.S. have tried and failed to halt the advancement of North Korea's nuclear weapons program through sanctions that have been skirted by many nations and without the full support of China, the North's principal trading partner. The Security Council is set to vote on a U.S.-penned resolution on Saturday, with the goal of pressuring Pyongyang and its rogue leader Kim Jong Un from continuing to develop its intercontinental ballistic missiles and nuclear capability. The resolution, written with the input of U.S. Ambassador Nikki Haley and experts at the State Department, is seen as a diplomatic coup because new punishing sanctions would not be possible without the support of China, which has been reluctant to add pressure on North Korea. The key issue going forward will be if these sanctions will be enforced and whether the sanctions will lead to the opening of negotiations with North Korean leader Kim Jong Un to put his nuclear program under international supervision. 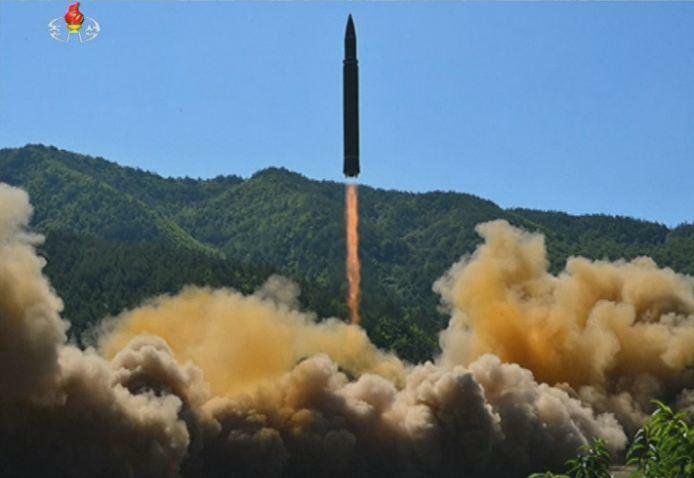 The proposed new sanctions follow North Korea's first successful tests of intercontinental ballistic missiles capable of reaching the United States on July 3 and July 27. The Security Council has already imposed six rounds of sanctions that have failed to halt North Korea's drive to improve its ballistic missile and nuclear weapons capabilities. The draft resolution condemns the launches "in the strongest terms" and reiterates previous calls for North Korea to suspend all ballistic missile launches and abandon its nuclear weapons and nuclear program "in a complete, verifiable, and irreversible manner." The U.S. spent weeks following the initial ICBM launch negotiating the text with China, North Korea's neighbor and ally. The diplomat, speaking on condition of anonymity because he was not authorized to speak publicly, called it the "most impactful and expansive set of sanctions to date" and said the resolution is expected to be approved unanimously. Agreement on the draft to be put to a vote followed U.S. Secretary of State Rex Tillerson's comments Wednesday reassuring North Korea that Washington isn't seeking regime change or an accelerated reunification of the Korean Peninsula -- comments welcomed by China's foreign minister. Tillerson also said the U.S. wants to talk eventually with North Korea, but doesn't think discussions would be productive if the North comes with the intention of maintaining its nuclear weapons. North Korea has repeatedly said it will never give up its nuclear arsenal, which it sees as a guarantee of its security. The draft resolution reiterates language in previous Security Council resolutions supporting a return to six-party talks with the goal of denuclearizing the Korean Peninsula, expressing the Security Council's commitment "to a peaceful, diplomatic, and political solution to the situation," and reiterating the importance of maintaining peace and stability in northeast Asia. It also expresses regret at North Korea's "massive diversion of its scarce resources toward its development of nuclear weapons and a number of expensive ballistic missile programs" noting U.N. findings that well over half the population lacks sufficient food and medical care and a quarter of the population suffers from chronic malnutrition. While the draft resolution would impose biting economic sanctions, the U.S. didn't get everything it wanted. Oil was not included in the draft resolution and neither are new air restrictions. But the draft resolution would ban all exports of coal, iron, lead and seafood. According to the diplomat, coal has been North Korea's largest export, earning $1.2 billion last year which was then restricted by the Security Council to a maximum $400 million. This year, Pyongyang was estimated to earn $251 million from iron and iron ore exports, $113 million from lead and lead ore exports, and $295 million from seafood exports, the diplomat said. That total is over $1 billion. It's unclear exactly how much money North Korea earns from sending workers overseas but in 2015 the U.N. special investigator on human rights in North Korea, Marzuki Darusman, estimated it was earning between $1.2 billion and $2.3 billion annually. Under the draft, countries would be unable to hire any new North Korean workers. The proposed resolution would also add nine North Koreans, mainly officials or representatives of companies and banks, to the U.N. sanctions blacklist, banning their travel and freezing their assets. It would also impose an asset freeze on two companies and two banks. The diplomat called the Foreign Trade Bank "a very critical clearing house for foreign exchange." The Mansudae Overseas Project Group of Companies, which was also added to the list, is described in the draft resolution as engaged in exporting workers for construction, including of monuments, in Africa and Southeast Asia. The draft resolution asks the Security Council committee monitoring sanctions against North Korea to ban the import of many more so-called "dual-use items" that have commercial use but can also be used in conventional weapons or biological, chemical and nuclear weapons. It would also give a green light for the committee to designate specific vessels that are breaking sanctions from entering ports all over the world, and to work with INTERPOL to enforce travel bans on North Koreans on the sanctions blacklist.